Cleveland Leadership Center (CLC) provides collaborative leadership training, civic education and connections to leaders of all ages, empowering them to identify and take action on issues that resonate with them and positioning them to become change agents in the community. 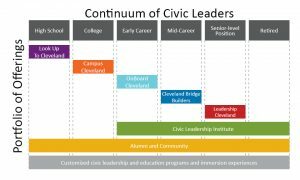 Cleveland Leadership Center educates, connects, inspires and engages leaders of all ages to drive positive community change through six key programs, as well as customized offerings and events. These offerings broaden awareness and understanding of social and economic issues, and increase participants’ desire and capacity to address them. By building informed, connected and committed leaders that have the knowledge, skills and desire to work together to confront and conquer challenges facing Greater Cleveland, we are building a better community for all.